The price of gold rose strongly in 2016 and during the first half of 2017. How will the gold price develop going forward? Let’s look at the key drivers influencing the price of gold and gold price forecasts by various analysts for 2018 and beyond. Following the high of the gold price of more than US$ 1,800 in 2011, the price began to fell more or less continuously from October 2012 on. This trend was for the first time sustainably stopped in 2016. The year 2016 ended with an increase in the price of one ounce of gold by about 8%, measured in U.S. dollars. The gold price at year end stood at about US$ 1,146. The rise of the gold price continued in 2017, when it increased by about 9% in the first half of the year to US$ 1,250 on June 27th. The price of gold is determined by the demand and supply for gold. Let’s have a look at the key drivers, both on the demand side, i.e., buyers of gold, as well as on the supply side. According to the World Gold Council the overall demand for gold can be broken down by the listed constituents: Jewelry accounted with 47% for nearly half of the total demand for gold in 2016. The second largest demand factor was investment demand with 36%. Following with a big distance was demand from centrals banks at about 9% of the total demand and technology demand, which accounted for only 7.5%. Total demand for gold moderately increased by 2% compared to 2015. Jewelry demand, industrial demand for technological applications as well as purchases from central banks decreased: Demand from jewelry sank by 15%, net purchases from central banks fell by about 33% and technology demand decreased by 3%. The combined decrease was more than offset by a large increase in investment demand: Total demand from investment – combining demand from gold funds and demand for bars and coins – increased by a whopping 70%, which resulted in the slight increase of total demand for gold. In tonnage terms, the decline in jewelry demand accounted for 347 tonnes of gold. Purchases from central banks decreased by 193 tonnes compared to 2015. In this context, the decline of industrial demand by 9.5 tonnes plays no significant role. The total decline was more than offset by the significant increase of investment demand by more than 640 tonnes. The significant decrease of jewelry demand can be attributed to declining demand from the largest consumers, India and China. The rising price of gold in 2016 put pressure on demand from both countries. Local factors added further to this. In this context, weakening economic growth in China and increased regulatory and fiscal challenges as well as a strike early in 2016 in India should be mentioned. The demonetisation in India, implemented by a sudden withdrawal of high-value banknotes was surely a key factor that led to a flight to gold resulting in a rise in the local gold price, and ultimately led to the drying up of demand due to the depletion of gold stocks by dealers. Central bank purchases were still positive in 2016, but at the lowest since 2010. It’s important to understand that central banks can and in the past have often been net sellers of gold, so the decrease in purchase activity is putting pressure on the gold price, but it should be noted, that central banks are still net buyers of gold, i.e. increasing stocks of gold. According to the World Gold Council, the fall of foreign exchange reserves, e.g., as it is the case for China, probably led to overall lower net purchases by central banks. The rise in investment demand by 70% was driven by strong inflows in exchange traded gold funds. 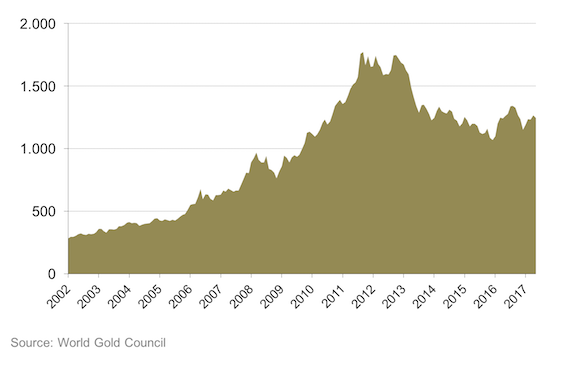 Demand for such gold ETFs was at the highest level since 2009. Demand for gold bars and coins was slightly lower than in 2015, but had no significant impact on the overall strong investment demand. 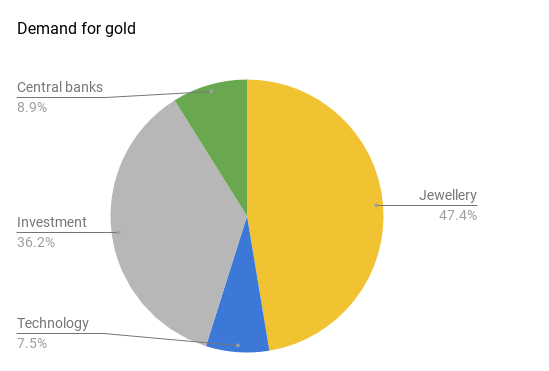 Supply of gold rose by 5% over 2015. While mine production was nearly flat, output from gold recycling increased by 17%. In addition, hedging activities by gold mining companies resulted in an increase of 95% of supply from this factor. Rising gold prices in the first nine months of 2016 had encourage miners to lock in high sales prices through hedging, i.e., selling future production at fixed prices. But comparing the supply factors in tonnage terms, net producer hedging only accounted for about 13 tonnes of additional supply, while the increase in recycled gold amounted to nearly 200 tonnes of gold. The development of the gold price in 2018 and beyond will be driven by the discussed demand and supply factors. Starting in reverse order, supply of gold in the short term is quite stable. A large increase in the gold price would probably result in higher recycling activity, which in turn would to some degree dampen a price rise. Net producer hedging is not expected to have a huge impact in any scenario due to its comparatively low amount, but in general, hedging is at least in the short term also likely to increase supply in case of rising prices. In the longer term, mining production is the biggest lever for overall gold supply. A rise in prices should increase production by mines, since mining becomes more profitable. On the other hand, exploration activities related to increasing production were muted over the last years. Even the emerging increase in exploration activities will take years to have a significant positive impact on new mine production. The conclusion in terms of gold supply is, that rising gold prices would have a positive effect on the overall supply both in the short- and long-term, but that there are no independent gold price trends expected to be triggered by the supply side. Therefore the demand side should remain the key driver for the gold price in 2018 and the following years. Due to its different constituents, demand for gold is very difficult to predict. While gold consumption in terms of jewelry and industrial demand is generally positively impacted by economic growth, the analysis is more difficult for investment demand. On the one hand, investment demand could rise with accelerating inflation, as gold could be perceived as a hedge against inflation. On the other hand, a difficult economic environment could lead to higher investment demand by investors, who see gold as a protection for their portfolios, or due to the fact that falling interest rates make it less important that gold pays no interest. As all these elaborations indicate, there is no clear effect of economic developments on the price of gold. Historically, gold is often viewed as a hedge in times of crises. What potential crises could loom in 2018 and impact the gold price? The 2016 decision of the voters in the United Kingdom to exit the European Union was a big surprise for most observers. The new terms of the relationship between the UK and the EU – as well as non-EU countries – are still unclear. The Brexit negotiations could negatively impact economic growth and stability in the UK and EU in 2018 and beyond. But it seems that a lot of the uncertainty is “already on the table”, which means in turn, that currently no development should be too surprising to anybody. Similar to the Brexit, the election of Donald Trump as the new president of the United States caught a lot of observers on the wrong foot. Interestingly, although a lot of gold bugs expected a rise in the price of gold in case of an election of Trump, the opposite happened: Donald Trump’s growth rhetoric nurtured expectations for economic growth as well as for rising interest rates. This probably explains, why the gold price fell initially. But in the eyes of many, the Trump administration creates or aggravates potential risks in the future. One such risk is that a failure of Donald Trump could potentially even result in an impeachment process, which would increase political uncertainty significantly. Other potential risks are seen in the conflicts in the Middle East and the relations with Iran. In a worst case, the world could see a military conflict between Saudi Arabia or the United States and Iran. Also the risk of a military escalation with North Korea cannot be excluded. The manifestation of such geopolitical risks would probably have a big impact on short-term uncertainties and thereby on economic growth prospects as well as the demand for potential safe haven assets such as gold. Following the Brexit vote and the election of Donald Trump, the resulting fear of the rise of further populist or right-wing parties and figures shaped a lot of the political discussions in Europe in 2016 and early 2017. As of now, it seems that the fears by many will not materialize: The respective parties performed worse than expected in the Netherlands and France, opposition in the United Kingdom gained in approval and the German populist right-wing party has reached a low in approval rates ahead of the upcoming elections in autumn 2017. Currently, on this front, no significant events are to be expected for 2018. ABN Amro predicted a 2018 gold price of U.S. dollars 1,400.- in March 2017. The estimate is based on the assumption of lower US real yields and a decline of the U.S. dollar versus other currencies. Similarly to ABN Amro, the commodity analyst Eugen Weinberg of German Commerzbank expects a gold price of U.S. dollars 1,400.- by the end of 2018. Weinberg bases his forecast on the assumption that the gold price will be driven primarily by investment demand, which in turn relies on monetary policy, real interest rates, economic growth and risk spreads as well as political risks. End of April 2017, the World Bank updated it’s World Bank Commodity Price Forecast. For 2018, World Bank now expects a gold price of U.S. dollars 1,206.- per ounce. For the subsequent years, World Bank expects a continuing fall of the price of gold, down to US$ 1.000.- by the year 2030. It’s obvious, that analyst forecasts vary widely. Forecasts for the gold price in 2018 range from price declines to substantial increases. You can find more gold price forecasts by various analysts in our overview Gold Price Forecasts. What will be the price of gold in 2018? As in the past years, analysts’ gold price forecasts for 2018 vary significantly. There is no consensus on the gold price development. But of course this was to be expected: As the saying goes, predictions are very difficult, especially about the future. What does this mean for investors? In case that you have a clear expectation of future developments, e.g., with regard to the discussed risks, you could try to position yourself accordingly. But as discussed, even then, the effect of a materializing risk on the gold price could even then not clearly be predicted. The conclusion for investors, who realize these challenges, or who do not intend to predict the future, could be just to diversify their portfolios in order to minimize potential risks and decrease dependencies on single asset classes. Gold is a unique asset class with regard to its demand and supply drivers, and therefore gold can play a role in diversifying investment portfolios. In this case, investors should consider cost and safety aspects of gold investments, e.g., in making the decision between gold ETFs, gold bars and coins or professionally vaulted gold. We provide a comparison of vaulted gold providers. Gold Price 2014 – How will the price of gold develop in the coming years? Gold 2013 – What is the trend for the gold price in 2013 and beyond?